Van Cleef & Arpels will launch Ambre Impérial, the latest addition to 2009′s Collection Extraordinaire. Ambre Impérial follows recent entries California Rêverie and Rose Velours. Ambre Impérial was developed by perfumer Quentin Bisch. Notes for the spicy oriental include bergamot, pink pepper, amber accord, tonka bean, vanilla, benzoin and woods. 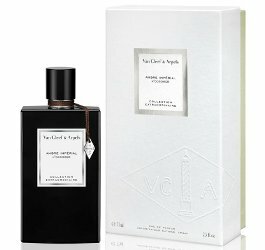 Van Cleef & Arpels Ambre Impérial will be available in 75 ml Eau de Parfum. Update: the description from Harvey Nichols..."Inspired by a dreamlike journey through the Orient, Ambre Impérial is a celebration of one of the most luxurious ingredients in perfumery. Sensual amber is glorified by the precious aromas of vanilla, benzoin and roasted tonka bean whilst pink pepper and bergamot add a charismatic freshness." What do people think of VCA’s quality overall? (No need to mention their prices.) I am still a little gun-shy after their horrid muguet, but I did like Midnight in Paris. I like a few of their Collection Extraordinaire. I never tried Cologne Noire which seems to be a favourite with a few bloggers, but I like their Bois d’Iris, Gardénia Pétale, Orchidée Vanille and rather like Lys Carmin. Out of their mainstream collection the only one I’m familiar with is First, which I think is brilliant. I would say the same, I’ve liked a few. I don’t think of the line as being “must try” though. I love Bois d’Iris….my second favorite Iris, after Iris Poudre…. Tried it today, after leaving flowers outside the French embassy (address: Pariser Platz, beside the Brandenburg Gate). Was looking for sth beautiful to distract from the horror of tonight. It’s very sweet. Burnt sugar with vanilla and ocean spray. Sweet-salty opening, smells very familiar but can’t remember what it reminds me of. Eau de Merveilles? Cacharel’s Lou Lou! Yes. Caramellised almonds on a Christmas market with the faint whiff of spiced whine punch? It smells expensive, powdery and somewhat French (whatever that may be), but it’s as gourmand as Bois d’Iris. As the burnt sugar slowly fades (it doesn’t disappear for long), it turns even more woody-powdery. Imagine an exclusive, vanillic, sugar-coated French pastry, slightly burnt and sprinkled with sea salt crystals and loads of Tonka bean.